Let Calm and Cool Trump ‘Fire and Fury’ The Cuban Missile Crisis came at a less dangerous time, and involved less dangerous men. “During the Cuban Missile Crisis we stood behind JFK. This is analogous to the Cuban Missile Crisis. We need to come together.”— Sebastian Gorka, a White House national-security aide, on “Fox & Friends,” Wednesday. What is happening with North Korea is not analogous to what happened in 1962, except for the word crisis. Fifty-five years ago was a different age with vastly different players and dynamics. We all mine the past to make our points, but Mr. Gorka’s evoking of the Cuban crisis to summon political support is intellectually cheap and self-defeating. 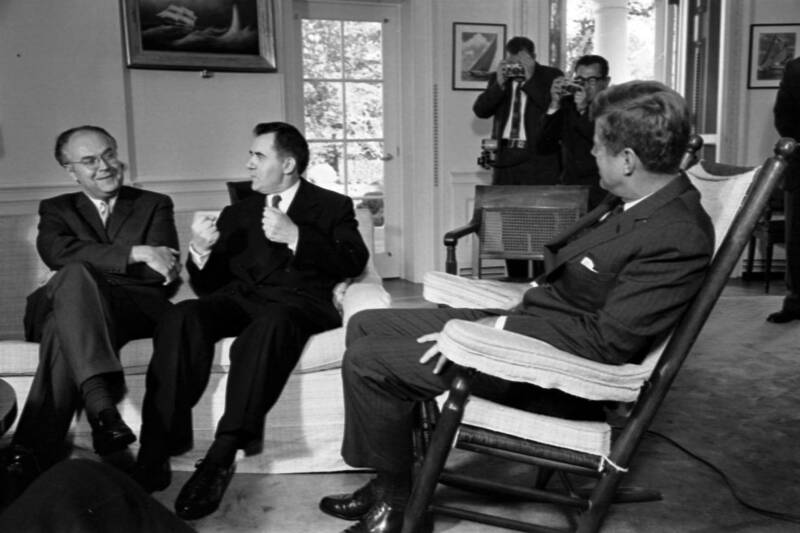 Soviet Ambassador Anatoly Dobrynin, Foreign Minister Andrei Gromyko and John F. Kennedy during the Cuban Missile Crisis in 1962. The Soviet Union and Cuba were trying to hide what they had—offensive missiles in Cuba. Kim Jong Un enjoys showing what he has and taunting the world with it. President Kennedy gave great and grave attention to reassuring a nation and world understandably alarmed by nuclear brinkmanship. Does Mr. Trump? Not in the least. The current crisis is Mr. Trump’s responsibility but not his fault. His three predecessors attempted, without success, to defang North Korea. How Mr. Trump handles it is his responsibility, and one hopes will not be his fault. More now even than in 1962—especially when the central players are talking so loud and so big—a great threat is of miscalculation, of misunderstanding a signal or overreacting to some chance event or mishap. In that area, at least, there are useful lessons to be drawn from ’62. In that crisis, Kennedy was verbally careful. He never popped off, because he knew words had power and how they will be received is not always perfectly calculable. He knew he could not use language—fire and fury—that invited thoughts of nuclear war. He knew that precisely because you are a nuclear power, you can’t make nuclear threats. A thing too easily referred to will lose its horrifying mystique, its taboo. So don’t go there when you speak, or allow people to think you’re going there. Kennedy tried for a kind of de-escalating clarity, except when he went for a de-escalating vagueness. He famously called his blockade of Cuba a “quarantine,” because a blockade is a military action and a quarantine is—well, whatever you think it is. He worked hard with aides on public statements, hammering out each phrase. He sometimes used dire language—we don’t want “the fruits of victory” to become “ashes in our mouths”—but he knew who he was up against, a Soviet premier whom he’d met in summit, and whose understanding of such messages could be at least roughly gauged. In Nikita Khrushchev Mr. Kennedy was up against a rational player. America and the Soviet Union had settled into a long Cold War. Our strategy was Mutually Assured Destruction, but the reigning assumption was that neither side would deliberately launch, because we weren’t evil and they weren’t crazy. We can’t assume that now. It is not clear Mr. Trump is up against a rational player. He must therefore ask if inflammatory language is more likely to provoke than inform. Some thought Kennedy, at 45, too young and immature for his job, but few thought him crazy, nor was Mr. Khrushchev’s reputation that of a madman. More than half the world at this point would see Kim Jong Un as mad, and some significant number might view Mr. Trump similarly. Thus the current high anxiety, and the need from America for calm, cool logic, not emotionalism. The general public now, however, would see Mr. Trump’s generals as the reliables, the dependables, the sophisticates of the administration. It would be good if they could become the American face—and voice—of this crisis. Some elements that helped resolve the Cuban crisis peacefully could probably never happen now. Ten days into the crisis, the president asked his brother, Attorney General Robert Kennedy, to meet privately with the Russian ambassador to the U.S., Anatoly Dobrynin. The purpose was to make sure the Russians understood the gravity with which the Americans were approaching their decisions; they didn’t want the U.S. position misunderstood. Both men were tired, and Dobrynin at one point thought RFK was near tears. The U.S. military, he told the ambassador, was pressing hard to invade Cuba. The president would have to agree if Khrushchev didn’t take the missiles out now. Dobrynin said he didn’t know if the Politburo, deeply committed to its position, would back down. They were both telling the truth and lying. RFK was putting it all on the military, Dobrynin on the Politburo, but both were under pressure. It was a private, high-stakes meeting held, successfully, in secret. Notes were not leaked. Could any of this happen now? Actually, it was lucky the players in the Cuban crisis lived in a slower, balkier world. They had time to think, to create strategy and response. The instantaneous world—our world—is so much more dangerous. Lessons from the Cuban Missile Crisis? Crises have a million moving pieces and need a central shepherd to keep track of them, to keep a government focused. Real-time decisions made under pressure need to be not only logical but logically defensible. And it’s wise to keep the temperature as low as possible, especially when things turn hot.